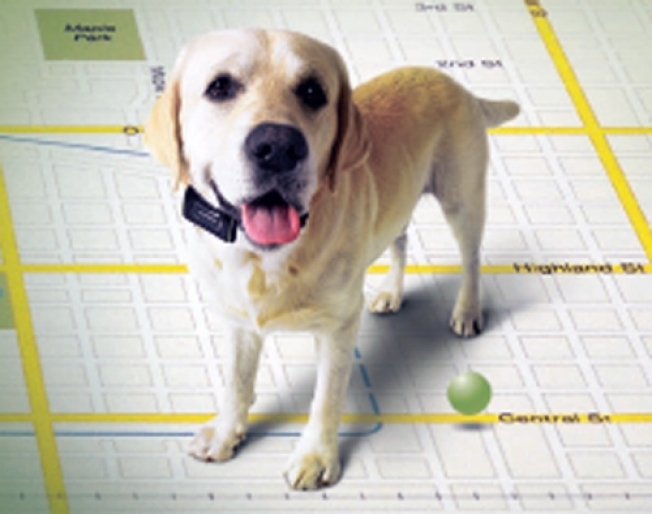 Strap a GPS locator on your pup, but think before putting one on your son. Tom Broadbent, of Westport, and his dog Wolf have been best buddies for the past three years, and as much as the pup loves his family, he's been living a secret life. "Our electric fence wouldn't contain him and we were trying to figure out what to do. Because we love him, we were afraid he was going to get hit by a car or something," Broadbent said. Tom's wife found a solution in Zoombak. It's a handy new device that employs global positioning system technology to track and locate whatever you want. The Broadbents clip the 2.5-ounce box to Wolf's collar. If he roams away from their home area, Zoombak will notify a list of people. "It will e-mail the nanny, my son, me, my wife, then we all know we've got a problem," Tom raves. Users log on to the Zoombak Web site, enter a proprietary password and the site maps the location of what you're looking for within a radius of a few hundred feet. Zoombak is being used nationwide to help locate cars, motorcycles and even kids. That's where an ethical issue can arise. West Hartford family therapist Laura Renfro said she's concerned that parents who use such a device for their children are taking the easy way out. "What could possibly replace solid parenting and a trusting relationship? And I can't think of any device that would replace that. You've worked long and hard enough from when they were little to have enough respect for you, so you do know where they are and you don't have to track them with a device," says Renfro said. Bill and Lisa Kall, of Farmington, have a 12-year-old daughter, but they foresee a time when Zoombak could be important to them. Lisa Kall said she thinks it would come in handy when their daughter reaches driving age. “I think it's a good thing, especially if it's something that can be hidden that she can't tell that we have so we can tell where she is," Lisa Kall said. Renfro believes the Broadbents have the right idea about the best use for the Zoombak technology. It gives them some piece of mind when their adventurous pup decides it's time to roam. Zoombak costs about $200 dollars, plus a $15 per month charge for the GPS service.